We have made a number of decorative knives and knife handles. The blades themselves can either be forged or ground, or even made and adapted from existing blades, depending on the customers requirements. 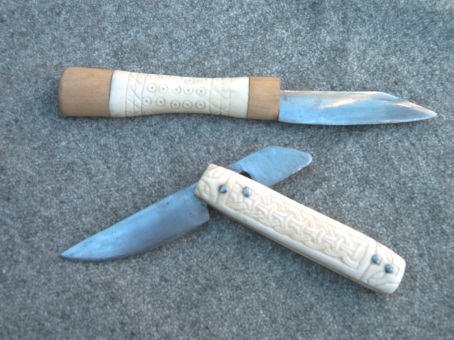 We have worked in a variety of materials for the handles, including horn, wood, and bone, and occasional all three in a composite style similar to Finnish knives. The below examples is a replica of a 9th-10th century Anglo-Saxon knife. The blade is a fairly simple angle backed blade, and the handle was copied from an original in the Victoria and Albert museum, the only alteration being the original was carved in bone, whereas this was replicated in limewood. It shows inhabited vine scroll common in Anglo-Saxon art of the period. 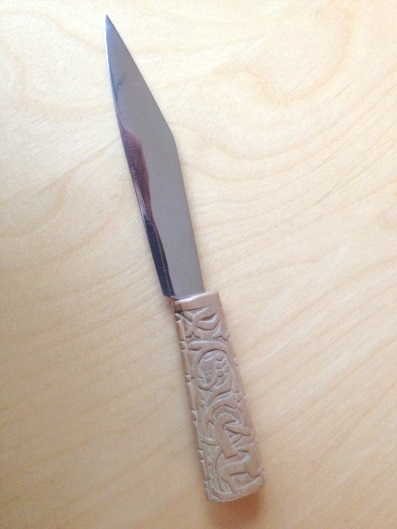 The below is a reconstructed replica of a Viking style knife. The blade shape is a common shape in Scandinavia, where the angle-backed knife is not well-known. 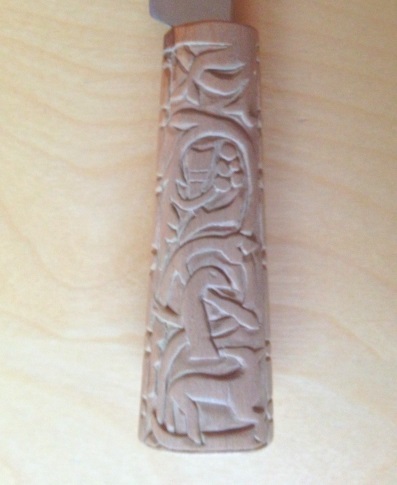 The handle itself is again made in limewood, and is based on a broken fragment of 10th century wooden handle from York. We have also made a number of simpler knives with wood, horn, and composite handles, as well and wood and bone cased pivot knives, known from many Viking-age sites in the UK. In addition we can also make just blades or handle for you to fit to your own objects as required, such as this large bone handle carved in the Jellinge style for Paul Binns, whom fitted it to a large seax.